Summary Of All Florida Case Law About Car Brakes Where Someone Was Injured. 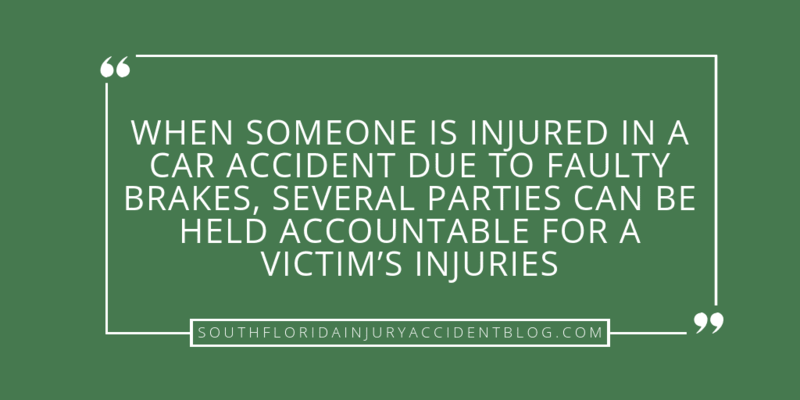 When someone is injured in a car accident in Florida due to faulty brakes, several parties can be held accountable for a victim’s injuries, including the car maker, the seller, as well as those who have done repair or maintenance on one of the vehicles. Below are summaries of Florida’s case law on defective brakes and the failure of a vehicle’s braking system to operate properly. The value of reading these cases is that they outline some of the most important issues for plaintiffs to focus on when pursing a claim, whether their claims are based upon negligence, strict liability or any other tort related cause of action. Note: it is outside the scope of this article to discuss case precedent involving claims under Chapter 681 of the Florida Statutes, known as Florida’s Lemon Law (which relates to the repair, replacement and refund of a defective car), and/or under the Magnuson-Moss Warranty Act (the Federal Lemon Law). Cohen v. General Motors Corp., Cadillac Div., 427 So. 2d 389 (Fla. Dist. Ct. App. 1983). Dr. Bernard Cohen was only trying to help when he was seriously injured by a 1978 Cadillac rolling over his leg. Dr. Cohen had come to the aid of the Cadillac’s owner, and as a Cadillac owner himself, he knew that the brake’s manual release lever was under the dash. When the Good Samaritan approached the Cadillac to help, the car was running. The driver told Dr. Cohen the gear shift was in “park.” This was wrong: it was in “reverse.” When Dr. Cohen released the manual parking brake, the car rolled backward and over his leg, causing serious injury. So, Dr. Cohen sued Cadillac for his personal injury damages. His lawsuit was based upon (1) strict liability; (2) implied warranty; (3) breach of implied warranty of reasonable fitness for use, and (4) negligence. He lost. Both the trial judge and the appellate court held that even if the Cadillac’s automatic brake release failed to work, the proximate cause of injuries sustained by Dr. Cohen was not failure of the car’s automatic brake release, but his own use of the properly functioning manual brake release. Masker v. Smith, 405 So. 2d 432 (Fla. Dist. Ct. App. 1981). Several years back, Andrew Masker bought a used 1957 automobile from Richey’s Used Cars. The test drive went well and so did the “as is” sale. Mr. Masker drove his car off the lot without a problem. However, 11 days after the purchase, the brakes on the car failed as Mr. Masker approached a stop sign. Since he could not stop the car, Mr. Masker went past the stop sign and into the intersection, where he collided with another car. Andrew Masker sued the owner of the used car lot for his personal injuries suffered in the crash. He asserted claims that (1) the car dealer had negligently fixed the brakes before he sold the car to the plaintiff; and that (2) there was a breach of an implied warranty of fitness as well as (3) strict liability because the defendant had created an unreasonable risk of harm by placing the car into the marketplace with a defective braking system. To support his position, Mr. Masker introduced the testimony of the prior owner of the car, John Young. Mr. Young testified that he had owned the car for five years. He could not recall having any work done on the brakes, but that did not mean the brakes had never been repaired or maintained, he just had no recollection or documentation of any brake work. Mr. Young’s testimony was supported by the testimony of his car mechanic. Mr. Masker also hired an accident reconstruction expert to analyze the crash. This expert testified he had torn the car’s brake system down to find an earlier brake repair involving an improperly installed O-ring in a wheel cylinder. This mistake, the reconstruction expert explained, had allowed brake fluid to leak and the brakes to fail. The trial judge ruled against Mr. Masker. The appellate court then found that it was an “inescapable conclusion.” Meaning, this was a latent defect (hidden) in the car’s brake system which the used car dealer would not be able to discover unless he had taken the entire brake system apart, as the reconstruction expert had done during his investigation. It did not matter that Mr. Young, the prior owner, could not remember if any work had been done on the car’s brakes. This did not create any issue of fact regarding repairs done by the used car dealer. Both the trial judge and the appellate court found that the defendant, the used car dealer, was not liable for (1) breach of warranty because of brake failure of car purchased “as is,” and (2) strict liability did not extend to dealer for latent defects for which he was not responsible and which he could not have discovered by exercise of reasonable care. Thus, the car dealer was not negligent in failing to discover the defective brakes and was not liable for injuries suffered by his used car buyer when the brakes failed. Lash v. Noland, 321 So. 2d 104 (Fla. Dist. Ct. App. 1975). Hyman Lash started off one Florida morning by driving to his country club in New Smyrna Beach to play golf. Mr. Lash got a club golf cart, and drove off to the first tee. Seeing some friends, he stopped and parked the golf cart on an incline and set the brake. When Mr. Lash got out of the golf cart the cart rolled backward pinning him between the cart and a parked car. Mr. Lash suffered bodily injuries as a result of the accident. He then sued the manufacturer, Club Car, Inc., as well as Noland Golf Cart Service, and Dale Noland, individually, for negligence. Mr. Lash lost at trial when the defendants requested a “directed verdict” at the close of the plaintiff’s case and it was granted by the trial judge. Lash appealed the judge’s decision, seeking a return of the case to the trial court so the jury could make the decision. On appeal, he pointed to the club golf pro’s confirmation that there had been previous complaints about the cart’s brakes. The evidence was clear there was prior knowledge that the cart had brake problems. However, Hyman Lash did not pay for a testifying expert to opine on the cart’s brake defects; the defendants did. The defense expert testified that the braking system design was far superior to that used in other golf carts. So, Mr. Lash lost on appeal. The reviewing court found that there was “no allegation, nor any proof, of negligence.” It was not enough to show that the brakes failed and the cart pinned him to the car. “That the accident happened is not sufficient,” explained the court. Holman v. Ford Motor Company, 239 So. 2d 40 (Fla. Dist. Ct. App. 1970). Lee Holman was company president and one of his company perks was a company car. Mr. Holman drove a 1966 Thunderbird and after about a year of driving the company T-Bird, he noticed the brakes were not working as they should. So, Mr. Holman took the car to Duval Motor Company, an authorized Ford dealership. This was the same dealership where he routinely took the company car in for service, and where the Thunderbird had been purchased for him. The dealership determined the car needed a new power brakes booster system or unit. The part was ordered from Ford Motor Company in Detroit, and then installed by Duval. This brake part, the “booster unit” was sealed upon arrival at Duval. It is a self-contained device. The device is installed on the master brake cylinder on the forward side of the firewall. It is linked to the brake foot pedal on one side, and linked by a rod to the master brake cylinder on the other. The function of this booster unit is to give a power assist to the hydraulic brake system. It does this via a vacuum system within the unit, the initial vacuum being supplied by a hookup between the booster and engine. At trial, Duval’s witnesses testified this booster unit arrived as a contained unit, and that no one at the dealership was allowed to alter or change its inner workings. If a booster unit failed, they did not try and fix it; instead they replaced the entire part. This was the procedure followed when the dealership worked on Mr. Holman’s Thunderbird: they replaced the unit without trying to repair the original. After the replacement was installed, two dealership employees took the car for a road test. During this test, the brakes seemed fine. The dealership called Mr. Holman to let him know his Thunderbird was ready for pick up. Lee Holman arrived to the Duval dealership and took possession of the Thunderbird. Within minutes and just a few blocks of the dealership, Mr. Holman’s brakes failed in the middle of downtown Jacksonville traffic. Acting quickly to avoid hitting several pedestrians, Mr. Holman veered into a parked car in order to stop the T-Bird. He then sued both the car maker, Ford Motor Company and the dealership, Duval Motor Company, as an authorized Ford dealer. He alleged each defendant was liable based upon (1) negligence and (2) breach of implied warranty. At trial, each defendant pointed fingers at the other. Both defendants recognized that Mr. Holman had suffered an injury, for which at least one of them was legally liable on one or more of his legal theories. Ford argued that the brake failure resulted solely from faulty installation by Duval’s mechanics. Duval argued the brake failure was a direct result of a defective part in the sealed booster unit furnished by Ford. Ford also presented expert witnesses that testified if a part called a “tailstock” within the T-Bird’s sealed booster unit was broken, the only result would be a loss of the unit’s power assist. The car’s basic, non-power brake system would still work. Right before the case went to the jury, there was some legal maneuvering regarding withdrawals and amendments of motions, and the end result was that the case was submitted to the jury against Ford alone on both the counts of (1) negligence and (2) implied warranty. On appeal, the District Court of Appeal held that there was no evidence, direct or indirect, of a defective power brake booster unit which allegedly caused plaintiff’s automobile accident. Nor was there any evidence that the booster unit was installed by the dealer in any unusual or improper method. Accordingly, the appellate court held when the evidence was conflicting regarding the brake failure or subject to different inferences as to what caused it, the case must go to the jury for its consideration. The conclusion that negligence is the most likely explanation of the accident, or injury, is not for the trial court judge to make. As long as the plaintiff, Mr. Holman, provides sufficient evidence to permit the jury to draw the inference of negligence, the case must go to the jury, so the jurors can decide, as reasonable men may differ as to the balance of probabilities. The case was returned for a jury trial. Rawls v. Ziegler, 107 So. 2d 601 (Fla. 1958). Edward and Laura Rawls were driving along, with Laura at the wheel, when Laura began slowing down to a red light. Traffic was heavy. Behind the Rawls’ vehicle came driver Paul Ziegler. He testified he was around two car lengths behind the Rawls, in the same traffic lane, when she slowed down and stopped. He was driving between 20 to 30 mph at the time. Paul Ziegler was driving a two-ton dump truck with a Chevrolet chassis and a five-yard dump body. A month earlier, the truck had been purchased by his father J.H. Ziegler from Luby Chevrolet Co., who had paid Cecil & Bruce Truck Equipment Co to mount the body of the truck on the chassis. The truck carried a full six-yard load of gravel. It was undisputed that the truck was overloaded according to the manufacturer’s recommendation in its Chevrolet Data Book, which recommended only a two and one-half or three yard dump body for the hauling of coal, sand and gravel. Additionally, its Truck Operator’s Manual had the recommended gross vehicular weight as 16,000 pounds, a copy of which was given to Mr. Ziegler when he bought the truck. According to Mr. Ziegler, he hit the brakes on his truck. Something was strange: he was not able to depress the brake pedal. He could not stop the truck in time to prevent rear-ending the Rawls’ vehicle, so he swerved. While he succeeded in avoiding a full head-on collision with their car, he did not clear it. Ziegler’s truck sideswiped the Rawls’ vehicle on its left side. As for the Rawls’ car, accident scene photographs revealed a large hole in their top left fender and extensive damage to their left rear door. The dump truck fell apart in the crash. The rear end of the truck came off the truck body, with the real axle, the rear wheels and their springs photographed several feet behind the truck itself. Evidence at trial confirmed that the rear end was attached to the truck body by the spring hangers at each end of the two rear springs. The four rivets holding each spring hanger to the frame had been sheared off, even with the frame on the two spring hangers on the right-hand side. On the left, the left front spring hanger had broken, leaving a small portion still attached to the frame by the two bottom rivets; the left rear spring hanger was still attached to the frame, the rivets intact. Mrs. Rawls was seriously injured in the collision, as she was shoved by its impact into the steering wheel. The couple then filed a personal injury lawsuit. (3) Cecil & Bruce was negligent in (a) placing upon the chassis of the truck a body reasonably calculated to carry a payload in excess of that for which the truck was designed and (b) placing upon the chassis a body in such manner that the truck became a danger and hazard to persons using the public streets. At trial, J.H. Ziegler stated that he bought the truck from a salesman of Luby. He specified he wanted to buy a two-ton chassis with a five-yard dump body mounted on it, and he would be using it to haul fill. The saleman told him this truck “would do the job.” Mr. Ziegler requested the springs to be built up “to carry the load,” and five extra leaves were added. Other extras purchased by Mr. Ziegler were larger tires, a two-speed axle, and a vacuum brake booster. Mr. Ziegler dealt only with Luby. He was billed by Luby and paid Luby for the completed truck. Luby’s salesman did not advise him as to how much of a load he would carry in the truck. Luby’s salesperson did not warn him against overloading. After the purchase, Mr. Ziegler himself added a six- or eight-inch board to the dump body so that the five-yard body would hold six yards. It was customary in the area to put a five-yard dump body on a two-ton chassis. Cecil & Bruce testified they had mounted 30 or 40 bodies on two-ton rated chassis in the past year. The “greater majority” of these were five-yard bodies. The Court found it was clear by the evidence that overloading of the truck helped to cause the crash. However, no evidence was presented that Luby could reasonably have foreseen that Ziegler or his sons would operate the truck in an overloaded condition. Evidence was provided that the overloading of the dump truck on the built-up springs could not reasonably be found to be the sole cause of the accident. Concurring causes also included the brake failure. The possible failure of truck driver Paul Zeigler to operate the brakes properly at what might have been an excessive speed in the circumstances; and some exceptional force applied to the rivets, such as the sudden swerving of the truck or its impact with the plaintiffs’ car. According to the Florida Supreme Court, “regardless of whether the jury may subsequently exonerate Paul Ziegler of negligence (as to which we express no opinion), the fact remains that, superimposed upon the negligence, if any, of Luby, were independent interviewing forces without which the accident would not have occurred. In sum, where an independent force or act intervenes to bring about a result that the defendant’s negligence would not otherwise have produced, it is generally held that the defendant is liable only where the intervening force or act was reasonably foreseeable. What Do These Cases Tell A Victim? These brake failure cases make it clear that an injury victim must prove, using credible admissible evidence, all elements of negligence to prevail with a claim. Also, these cases show how defense attorneys will use the rules of civil procedure, by filing Motions for Directed Verdict (at trial) and Motions for Summary Judgment (before trial begins), to get a judgment entered in favor of their client. However, just because it is easy for a plaintiff to recite the elements of negligence doesn’t make it easy to prove negligence. One way to do so is through expert analysis and testimony (see Holman, Lash, Masker). Knowing which experts to hire, and how to prepare them for trial, can mean the difference between winning and losing a case. For more on the elements of a negligence claim, read: Negligence Lawsuits in Florida. A good piece of advice if you or a loved one are injured in a car accident caused by defective or faulty brakes, is to speak with an experienced personal injury trial lawyer to learn about the type of evidence needed to prove a claim and how most insurance companies respond to these claims. Most personal injury lawyers, like Alan Sackrin, will offer a free initial consultation (over the phone or in person) to answer a victim’s questions and to share what they know about defective brake claims.